I'm still shocked at how successful our group barrel project beers have all been. We've made some delicious beers even without the benefit of having multiple barrels for blending, or the temperature control that many breweries employ. In the the first round of the National Homebrew Contest this year (Tennessee region) the Bourbon Barrel Wee Heavy (an Imperial Oud Bruin as I dubbed it) scored a 40.5 while the Red Wine Barrel Flanders Red scored a 38 (both made it to their mini-best-of-show rounds, but sadly neither advanced). After the wee heavy was bottled in March 2010 we refilled the bourbon barrel with a big dark beer. I'd place the base beer somewhere between the indistinct meta-categories of porter and stout. With a second use barrel, the wood had already given up most of its bourbon flavor lending a more neutral contribution to the beer. We did not rinse the barrel until after we bottled the porter, so it will be interesting to see how the intensity of the wood flavor in the third beer compares. The Bruery is releasing a soured stout (Tart of Darkness) of their own soon, I think we'll see more soured dark beers of over the next few years as people realize how good the combination of vinous tartness and roast can be. Appearance – Pours pitch black, even when tilted to the light no photons get through. The dense tan head has great retention and trails coating lace down the sides of the tulip. Nice to see this beer have a good head, there is something about a stout that makes it seem essential. Smell – Smells like a Flemish stout (if such a thing existed): cherries, vinous, coffee, hints of vinegar, musty basement wood. Wonderfully aromatic and complex. It is surprising how little barrel character it has compared to the first beer the barrel saw, which was saturated in vanilla and coconut notes. Taste – The firm acidity is countered by a moderate residual sweetness. The coffee-like roast is there as well, but more subdued than it was in the nose. The sourness is assertive, but neither harsh nor sharp. The finish has some of that damp oak. There is a gentle alcohol warming, but as funk/sourness often do it is hidden well. Mouthfeel – There is enough body to support the disparate flavors of sourness and roast. Carbonation is moderate-light, about right for a beer with this much going on. Either less body or more carbonation and this could have been harsh (we're lucky it stopped at the gravity it did). Drinkability & Notes – The character is pretty close to mixing a Flanders Red with a Foreign Export Stout. I wish it had gotten a bit more barrel character, although as it stands it is pretty close to what I would imagine a porter made by Rodenbach (which is ironic because Alexander Rodenbach studied English porter before opening the brewery that bares his name). I love this beer Mike, though the NHC judges in Dallas didn't (29). So much going on with the sourness and roasty complexities of the stout. As an aside, our 1st barrel beer, the Flanders scored a 41 and took 2nd in the Spirit of Free Beer in the Sour Beer Category. What did you enter it as? With these weird beers I find the description is a big part of getting a good score. There are so many different ways you could describe this beer. Entered as a Flanders Red...Both judges picked up on the oak and wine character. What bacteria / brett went into this beer? Hey Mike, I'm going over your blog, it's really awesome! Keep up the good work. 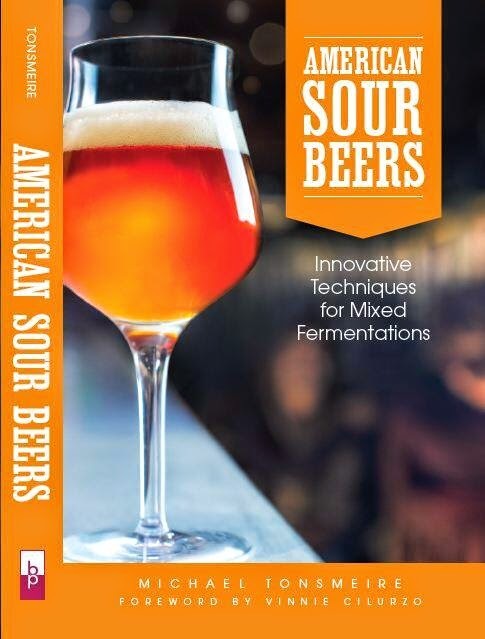 How long does it take to acquire a taste for the sour beers? I'm not a fan of them, but hoping that as my brewing knowledge grows, my pallet will develop. The bugs were just what was left from the previous beer. It was an unintentional lactic culture, plus some bottle dregs we added as it aged. Not sure I have notes on exactly what dregs we used, but you could check the wee heavy post. I hated my first bottle of Cantillon. It took maybe 6 months for me to genuinely enjoy a "real" sour beer, but my palate is still changing. The more I drink sours the less I taste the acid and the more the complexities come out. Start with less acidic beers and expand from there. This sounds absolutely delicious. I imagine the sweet & sour + earthiness is very intriguing. The timing on this is perfect...I'm brewing a 10g batch of a robust porter this weekend and souring half. Should have known when I started googling for tips, you're blog would be the first to pop up. I'm glad to see your notes on the roastiness and your concerns about it. I'm dialing down the roasted barley in my recipe just a bit, so I'm happy to see that worked out for you. Acquired a used Bourbon County Stout barrel from Goose Island (2011). Barrel is in great shape with a gallon or so of stout still rolling around inside (Had to drink about half of that myself for experimental reasons!). I love the idea of solera, and your bourbon barrel sour brown just might just fit the bill. Mike, would you recommend this route? Any advice, direction, or redirection would be greatly appreciated. That sounds great. My first piece of advice is to rinse out that barrel as soon as possible. Leaving beer in the barrel is a barrel is a good way to give Acetobater a head start. We made that mistake with our apple brandy barrel, and the beer is already borderline too vinegary for my taste after a year. Thanks for the advice, Mike. OK to sit empty for a week or two? If you rinse it first you should be fine. Just drain it, add a couple gallons of hot water, roll it around, and then empty it again.